I can't even believe we're talking back-to-school! Didn't summer JUST start??? Open House is absolutely wonderful! I get to meet the sweet families that I will from that point forward forever call my own...I expand the number of children that I affectionately refer to as mine! Here's the thing though, on the inside, I'm crawling with nerves, and feelings of awkwardness. For real, y'all. Parents and their kids come to the door, we say hello, and then everyone awkwardly wonders what in the world is supposed to happen for the next few minutes. 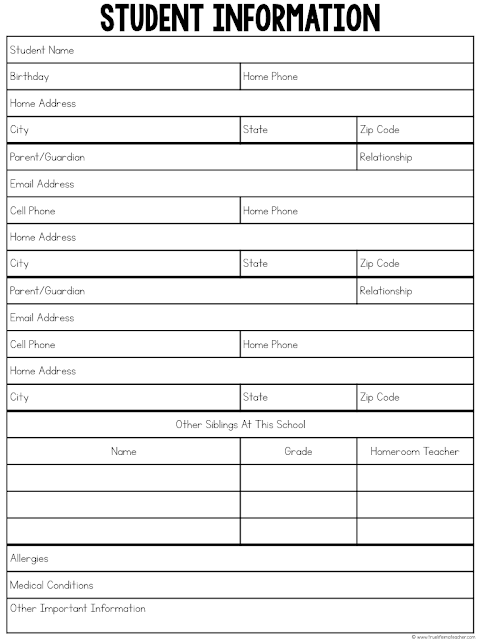 There's a billion things to make sure parents know about, forms to fill out, and on and on. Several years ago, I decided to try something different. For purely selfish reasons, of course. I can't handle awkwardness. Y'all, this is the single most brilliant thing I've ever done. Seriously. So what are stations, you ask? What do the parents do? What do the KIDS do? What does the teacher do? Stations are numbered areas throughout the room. 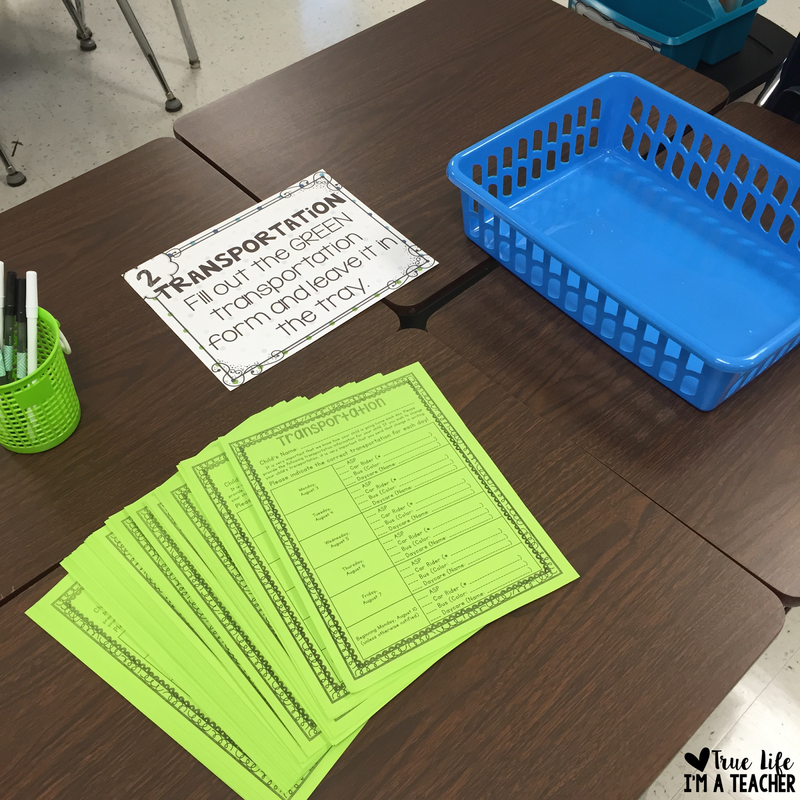 Parents start by signing in, and then continue through the rest of the stations. Once they get to the last one, they know they've gotten and done everything they need to do, and are free to leave. Prior to using stations, I felt like I was running around like a chicken with my head cut off. I felt like parents were waiting to talk with me, while I was talking with a different family. I felt like parents didn't know what they were supposed to do, and everything just felt so awkward. What do I have at each station? I typically use 10 stations. You could use more or less...that's the great thing about stations, you get to make them fit YOUR needs. This is the only station (unless someone looks lost) that I point parents to...I hand them their agenda, and tell them to start here. This is pretty much the most important station I have. I need to know how my students are getting home each day, and especially on the first day of school. Student info is pretty much the same no matter where you go. Does the office have this info? Yes. 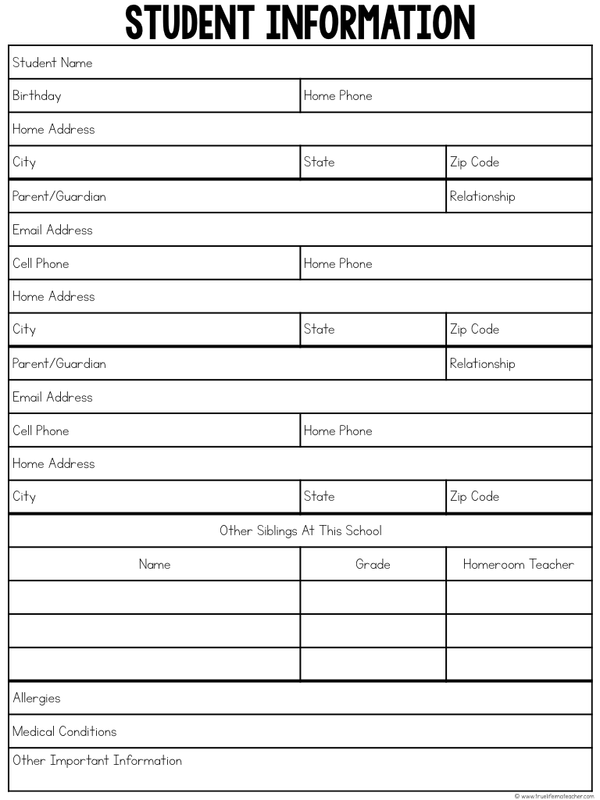 But I like to have it on my form, all in one "student info" binder that I keep in my classroom. Sometimes parents want to know when they can help, and I always direct them here. 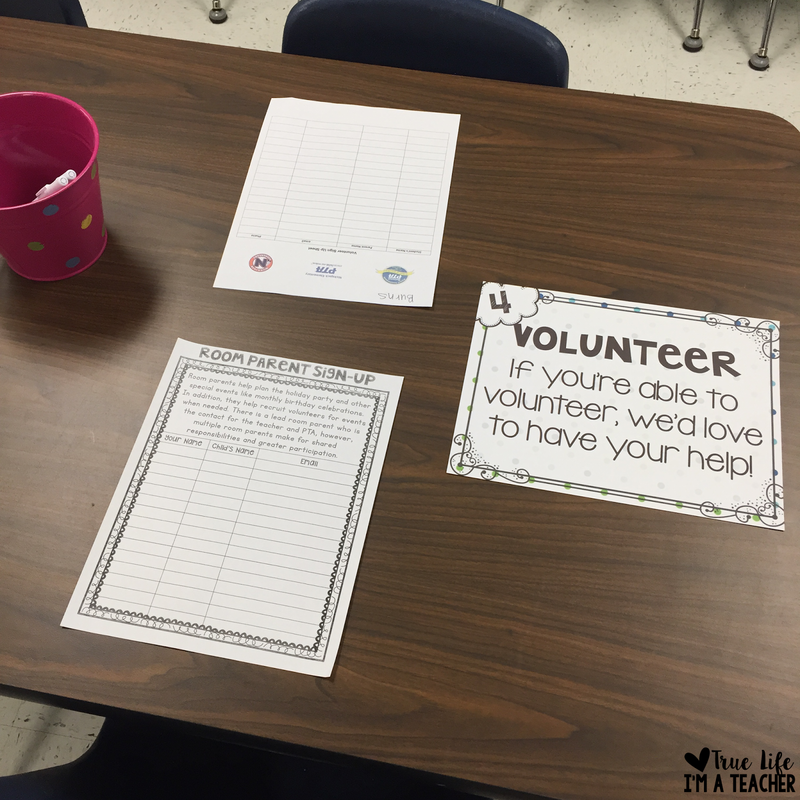 Some years I have lots of parent volunteers, some years I have zero. This is my favorite station (like, duh)! 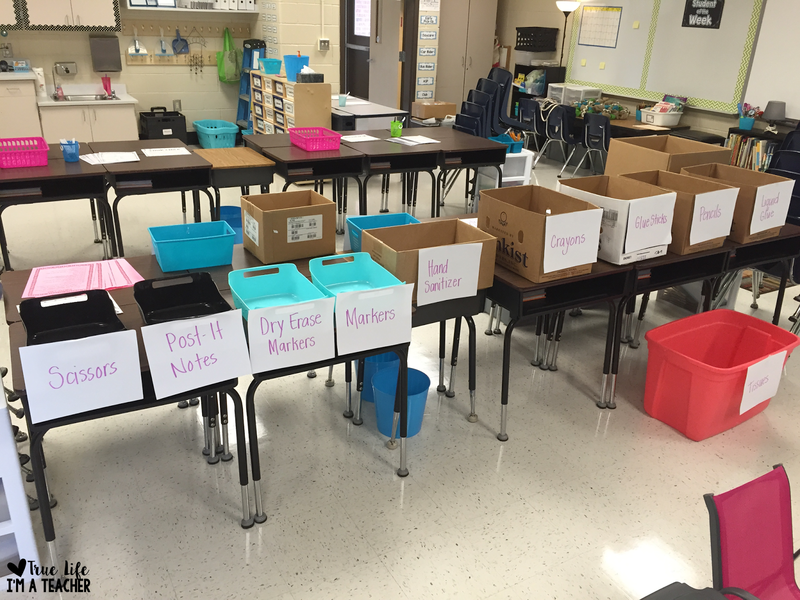 If parents brought supplies with them, I have them sort (this is a great job for the kids) the supplies into the containers. 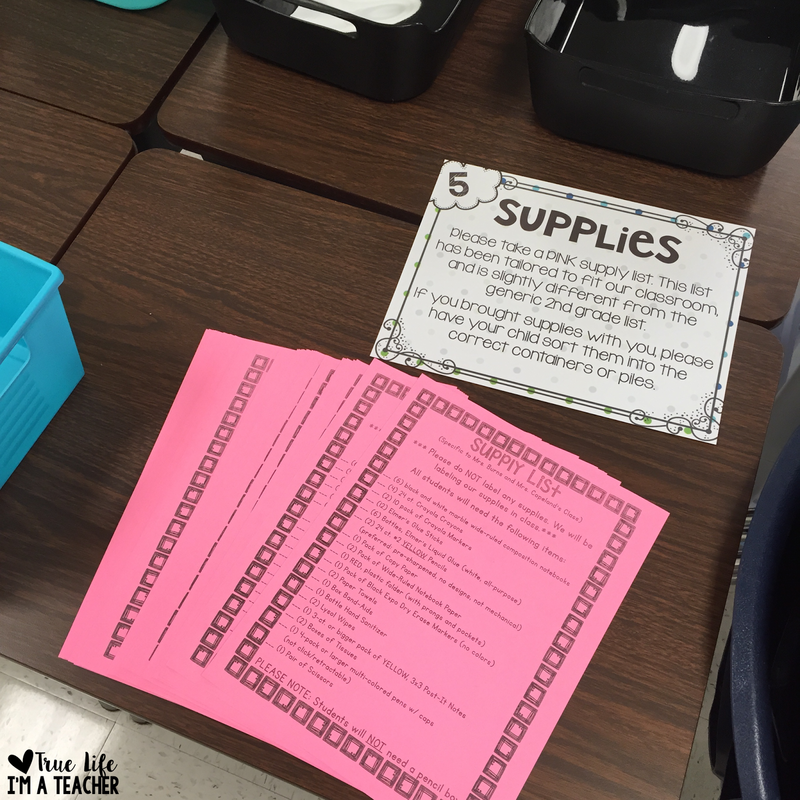 If parents didn't bring supplies, I have supply lists specific to my classroom ready for parents to grab. 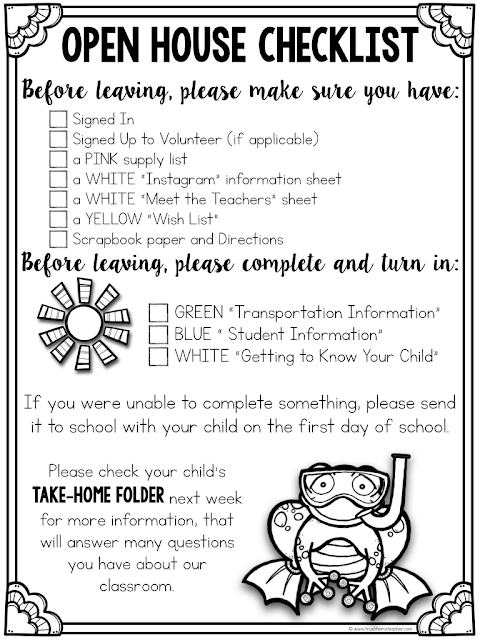 Last year, I did a class Instagram, and gave parents information with how to follow the class, as well as had them sign a permission slip. In years prior, I used text notifications through Remind (formerly Remind 101), but now there are a lot of different apps you can use, like Bloomz that The Elementary Darling wrote about. I like to have parents describe their child to me. It's let me get to know the child from their perspective. Parents pick up a sheet that tells them, and their child all about me. This is one station that I always hear a lot of comments from. I included a half sheet with items that are wish list items. Parents take one if they want, and send in supplies if they want. No pressure with a wish list. The scrapbook page station is where my students get their very first assignment for the new school year! I ask students to create a scrapbook page that tells all about them! 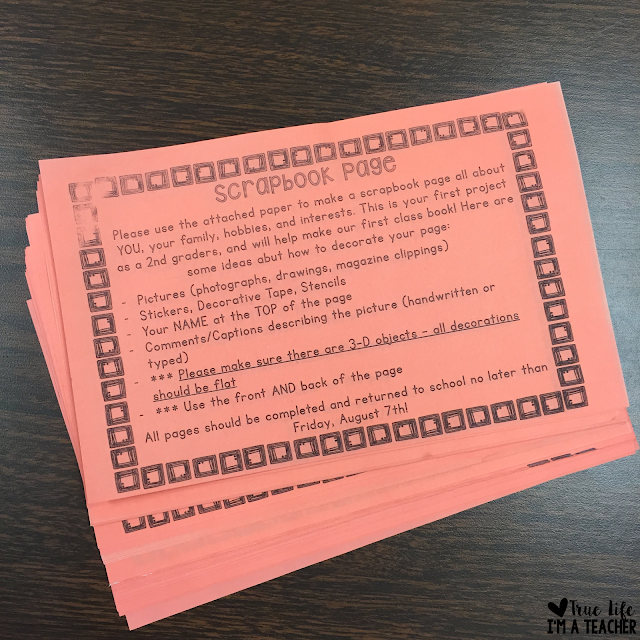 I usually have it due the end of the first week of school, and students present them to the class. The scrapbook page doubles as our first class book that lives in the classroom library! 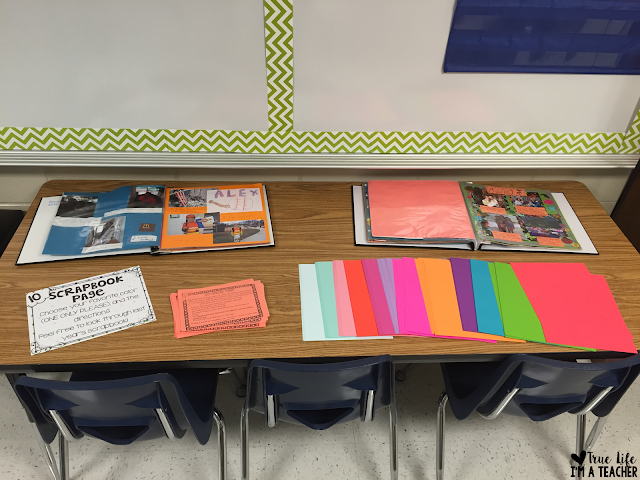 I provide the scrapbook paper and allow students to choose their favorite color. I also have examples from previous years that are always pretty popular! I tend to switch this up each year. 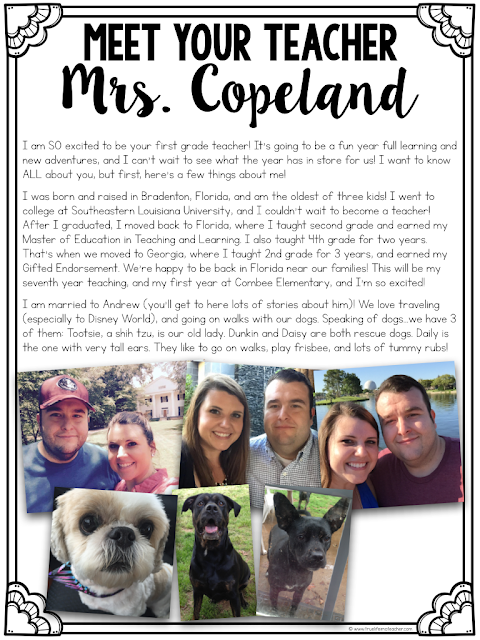 Some years I have some sort of "All About Me" page for students to complete. Sometimes, I ask students to sort their school supplies at station 5. Other times, I just let them go with their parents. 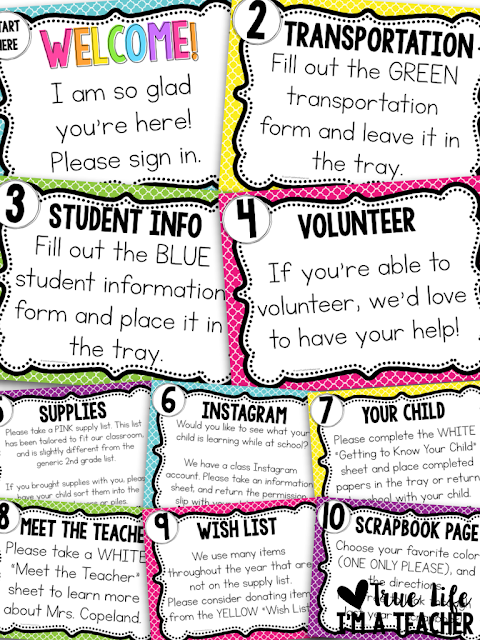 Tomorrow, Erin from The Elementary Darling will be sharing 10 ideas for STUDENT participation during open house, and I can't wait to read all about it! Read about it HERE. 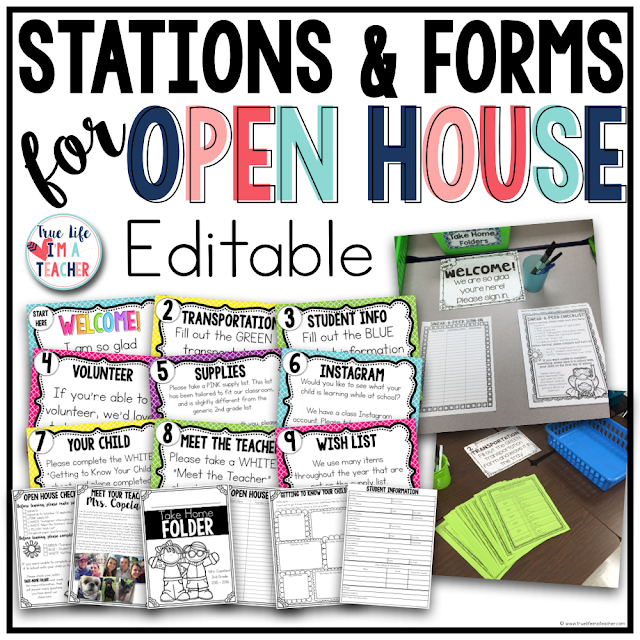 Wanting to try Open House Stations this year? I'd love to hear from you! 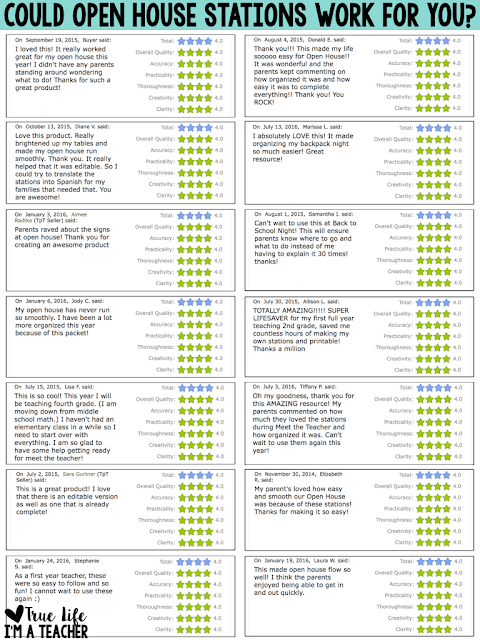 If you're interested in what I've shared (which is editable) you can find them HERE! What an awesome idea. So beautifully organized! 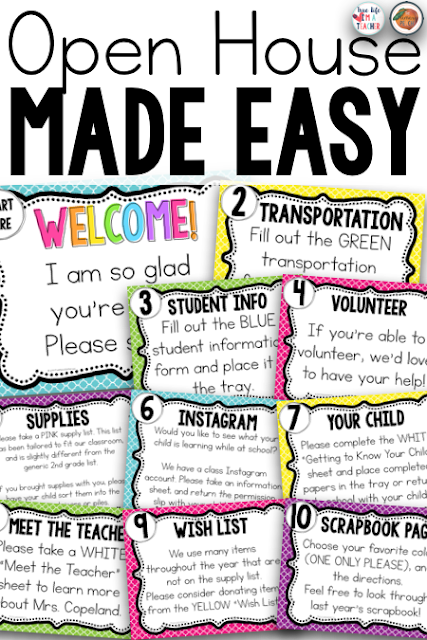 Great ideas and organization. Check your here/hear in the last paragraph of your get to know the teacher letter. Thanks for sharing your ideas! I am going from teaching 3rd grade for the last 20 years back to kinder. It is going to be so different than when I last taught kinder, so I am busily combing the internet for ideas. 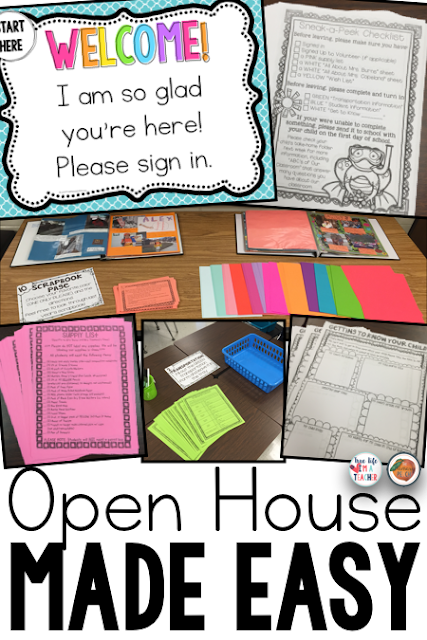 Thank you for your ideas on Open House. As I read your letter to introduce yourself to your parents, I see where you mentioned that you went to college at SLU. I did, too, although I graduated a very long time ago--in Dec. of 1977. I have lived in California for the last 28 years. It was funny to be out in blog land and see someone who also graduated from SLU. Have a good year. This is amazing and actually has me looking forward to Open House! I felt like I was listening to myself describe how Open House usually goes with the awkwardness and repeating myself while parents make a line to speak with me. Love this and worth every penny. Thank you so much! I purchased this set, because I needed a sign-up form just like the one you showed. The one that is included is different and has an extra column that I'm unable to delete. Do you have the version that was shown? Thank you. DO you sell the simpler version you have shown in all the photos? 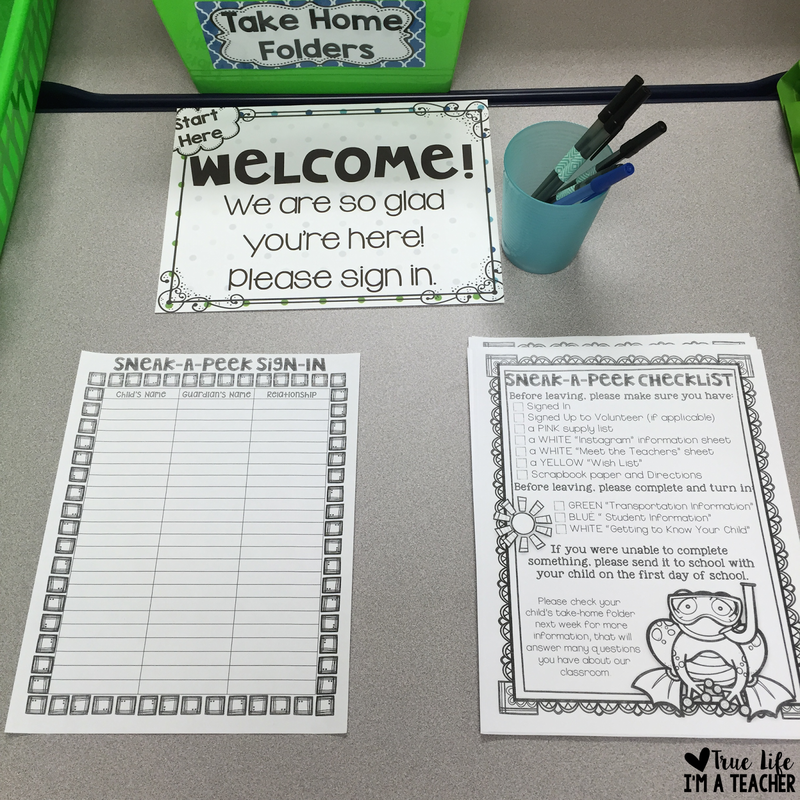 I am really in love with that version and LOVE your stations set up for meet the teacher night. If you do sell it can we get the link please? 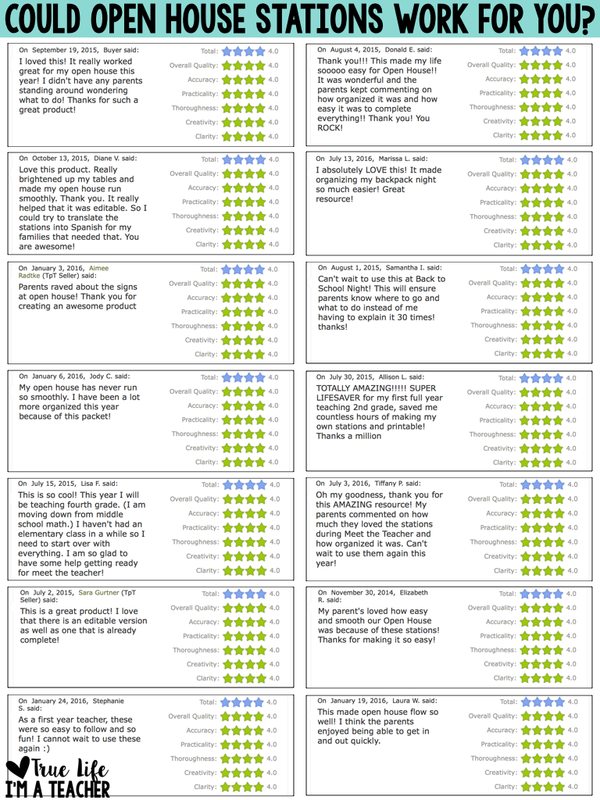 Excellent Work, This is a good and Informative post. In this post I truly got quality information.